The regathering of the Jewish People from the four corners of the world. The reestablishment of the State of Israel on May 14, 1948. The reclamation of the Land of Israel from a barren wasteland to an agricultural land of abundance. The revival of the Hebrew language from the dead. The reoccupation of the city of Jerusalem on June 7, 1967. The resurgence of Israeli military power. The refocusing of world politics on the nation of Israel. All of these events represent the fulfillment in whole or in part of very specific end time prophecies that can be found in the Hebrew Scriptures. I'm now going to take a look at a prophecy whose fulfillment began before the 20th Century, but it's not in the list of the seven that I just gave you. It's an amazing prophecy whose fulfillment began in the 16th Century and has continued to this day. It has to do with the Eastern Gate in the Old City of Jerusalem. In 1967 when the Six Day War broke out, I was a professor of International Law and Politics, and because I was following international politics I followed that Six Day War very carefully. I will never forget that when the war was over I read a very interesting news article one day. It said that when the Israeli's decided that they were going to take this Old City, which was under the occupation of the Jordanian forces, the logical way to do so was to hit it from the west over at the Jaffa Gate, rather certainly than the Eastern Gate because it was under Jordanian control. The Israeli's, always relying on surprise, decided they were going to hit Jerusalem from the eastern side, coming around under the cover of darkness to hit from that side. While they were discussing that strategy and the possibility of blowing open the sealed gate with satchel charges and catching the Jordanians by surprise, the newspaper then said that when that suggestion was made an Orthodox rabbi who was there said something to the effect, "No, you will do that over my dead body, because that gate is supposed to be closed until the Messiah returns." Well, I had no idea what that was all about. I had grown up in a church that did not teach Bible prophecy. I knew nothing about Bible prophecy. So, I got out a concordance and I looked up the word gate and I started looking at Bible verses. Guess what? I discovered Ezekiel 44 which has a prophecy that says this Eastern Gate is going to be closed, and it will not reopen until the Messiah comes. Then I got out the Encyclopedia Britannica and I started reading about the Eastern Gate. It said that no one knows for sure why this wall was sealed and closed, but the best story is that when these walls were being rebuilt in the 1500's by Suleiman the Magnificence that a rumor swept Jerusalem that the Messiah was coming. He called the rabbis in and asked, "What does this mean?" The rabbis replied, "When the Messiah comes, He is going to come from the east. He is going to go through the Eastern Gate, He is going to run all of you aliens out, and He is going to become the Messiah the ruler over the earth." 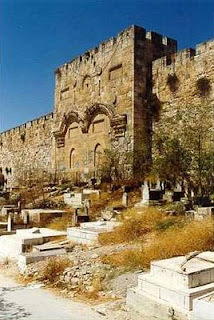 They dismissed the Rabbis and the order was given, "Seal up the Eastern Gate! Put a Muslim cemetery in front of it. That will take care of the Messiah, because He won't walk in a Muslim cemetery and He can't go through a gate that's closed." That's always been a special story for me, because that event is what got me interested in Bible prophecy. I was hooked from that point on. I could not believe that I was seeing a prophecy fulfilled right before my very eyes during the 20th century at that time. And so, I started studying Bible prophecy intently. That is why I call the Eastern Gate the "Gate to Prophecy," at least as far as it concerns me personally. In the second segment of our study of the Gate to Prophecy, we'll look at why the Eastern Gate is so important to the two advents of Jesus Christ. I have noticed and do wonder why are so many Christian leaders not talking at all on prophesy. I do thank and pray for their ministries, but as I turn on the various stations I have not heard but a few speak on prophesy. This has been going on for a long time too, can someone share some insight on this. There is good preaching, singing, teaching, but not too much on prophesy? Why not? Love this one. When my mother was dying, we told her that since heaven is such a big place, when we joined her in heaven that we would all meet by the Eastern Gate so to make sure and remember to go there and look for us. Jesus sure won't let a graveyard stop him! Jan, since so much of the Church today has adopted the Amillennial view, they just don't see Bible prophecy as relevant. Some even take a Post-Millennial view and believe they're going to turn the whole world Christian and give the kingdom to Christ at His return, and the reality of Bible prophecy puts a damper on their expectations. Interesting about the views, Nathan, thank you for your response thank you too Anonymous, I am going to meet Jesus when He appears, or calls me.